Read by my partner, quote - started off well, good ideas but lost steam and I lost interest! Yes, a bit of sloth never did anyone ever harm, that's what I say. Interesting to see if I have the same reaction as the previous reader. I read very little non-fiction, and those books I do are usually from other bookcrossers. This was actually a very enjoyable read. I think this was helped by the fact that the writer is completely NOT a new age hippie type. Think that helped me relate to him. Lots of good ideas in this book. I think I'll offer it as a ray. I'm now off for a big sleep! On its way to nice-cup-of-tea as first on the ray. Happy reading! 7 "It is no coincidence that the fastest nations are also often the fattest. Up to a third of Americans and a fifth of Britons are now clinically obese." 14 "Fast is busy, controlling, aggressive, hurried, analytical, stressed, superficial, impatient, active, quantity-over-quality. 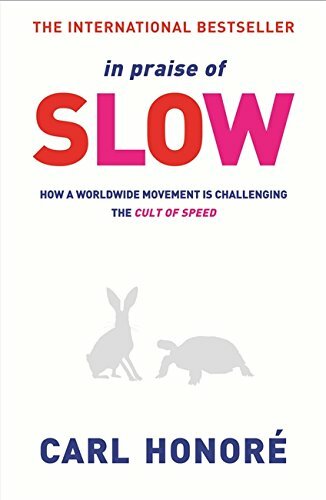 Slow is the opposite: calm, careful, receptive, still, intuitive, unhurried, patient, reflective, quality-over-quantity." 25 "The clock is the operating system of modern captialism, the thing that makes everything possible - meetings, deadlines, contracts, manufacturing processes, schedules, transport, working shifts." 49 "When people moan "Oh I'm so busy, I'm run off my feet, my life is a blur, I haven't got time for anything" what they often mean is, "Look at me: I am hugely important, exciting and energetic"
71 "There is something in the nature of cooking and eating together that forms a bond between people. It is not accident that the word "companion" is derived from Latin words meaning "with bread". A relaxing, convivial meal has a calming, even civilizing, effect, smoothing away the smash-and-grab haste of modern life." 122 "Let the mind be quiet and still. As one Zen master put it, "Instead of saying 'Don't just sit there; do something' we should say the opposite, 'Don't just do something: sit there." 189 "Why are so many of us still working so hard? One reason is money. Everyone needs to earn a living, but the endless hunger for consumer goods means that we need more and more cash. So instead of taking productivity goods in the form of extra time off, we take them in higher incomes." I'm really sorry this has taken me so long to journal. I've been getting married and away on my honeymoon! The honeymoon was a delightfully slow affair. It's a shame the same can't be said for the wedding. The best day of my life, and over so quickly! Anyway, looking forward to reading this now, having heard Carl Honore talk about it on the radio a few months back. I think it's just the kind of thing i need to read right now. The picture is of me buying lunch from St Joseph's Market in Barcelona. 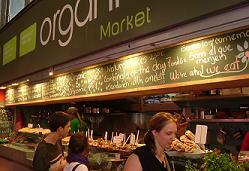 The organic stall was yummy! Been trying to access the site to journal the book for ages but (fingers crossed) here's my JE. It took me a long time to read this book, as i did devour it slowly. It was hard to read a lot at once so i dipped in and out, reading a few pages to a chapter at a time. I whole heartedly agree with the principles in this book. I would love to have more time, to be able to switch off from work, and to be able to live in a place where i felt slow values were appreciated. I am now very interested in visiting Ludlow, the first UK slow city, to find out what the differences are to other small towns in the UK. This book really made me think about where i was going and what i was spending my time on. It has also helped me to think about some major changes i hope to be making to my life in the next year. Will send on to Laura0141 as soon as i get her address. Received with thanks - sorry about the delay. I've actually boobed with this one as I read another copy while on holiday so I'll PM squirk for their addy now. Received safe and well, and I'm very much looking forward to reading it. This was a really good and interesting read. And I've re-evaluated a few things, such as thinking twice before launching into an email reply. Certainly the world is getting faster and attention spans have become shorter. Yay for slowness. My BF was very skeptical, as he said 'Yes, Slow sounds like a good idea, but how on earth are our employers ever going to give us a 4-day week?!' Not likely, but hey, ho. Received the book a couple of days ago. It is on the top of my TBR pile and I am looking forward to reading it. Hopefully at the end I will have learnt how to slow down!